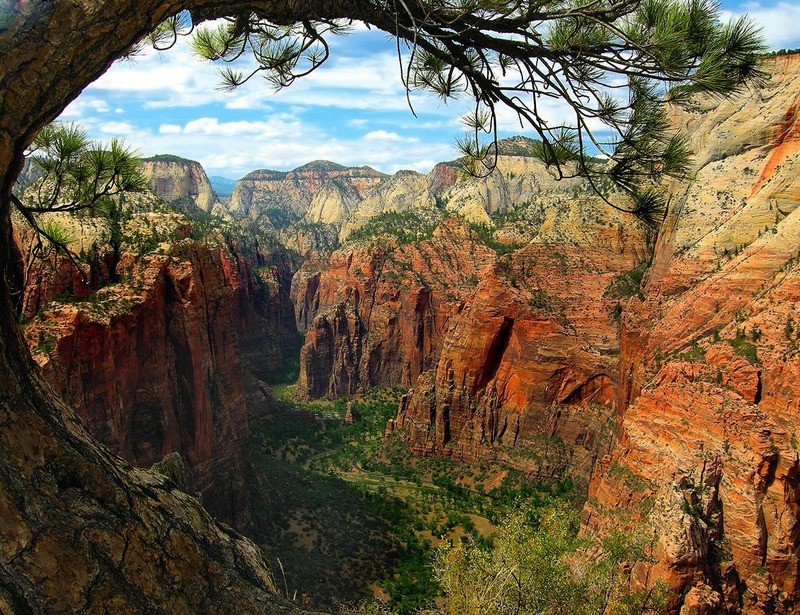 Truth and Light: Doctrine and Covenants Lesson 46: "Zion the Pure in Heart"
Doctrine and Covenants Lesson 46: "Zion the Pure in Heart"
Zion has been used to describe a number of different places, including Zion's National Park (see left). Enoch's city was called "the City of Holiness, even Zion". David's city, the ancient city of Jerusalem, was also referred to as Zion for a time. We are told that the New Jerusalem in the latter days will also be called Zion. "Therefore, verily, thus saith the Lord, let Zion rejoice, for this is aZion—the pure in heart; therefore, let Zion rejoice, while all the wicked shall mourn." "And the Lord called his people aZion, because they were ofbone heart and one mind, and dwelt in righteousness; and there was no poor among them." So we learn from these two sources that Zion is the pure in heart, those unified in heart and mind and who dwell in righteousness. Let's look at each of those characteristics a little more. This concept of unity can be hard to embrace in the modern world. Today's world is about individualism and self. If we focus on ourselves we will not achieve unity. To achieve unity we must all be focused on the same external source. Notice the factors that helped people dwell in righteousness: formation of Christ's church with the proper authority, humble and sincere repentance, baptism by immersion followed by the gift of the Holy Ghost being received. Here was a people focused on the Lord. And they created a Zion. Compare that with the Saints of the early latter-days who were commanded to build a Zion but failed. Read Doctrine and Covenants 101:6 and Doctrine and Covenants 105:1-5. The early Saints did not learn collectively what they needed to to be able to create a Zion. One of the things the Lord rebuked them for was not giving to the poor and afflicted. Did you get that? "If they labor for money they shall perish!" The way to solve poverty is not pursuing wealth. That will just kill you, spiritually and maybe physically too! Have you ever known people that say they are trying to pursue wealth to be of more use to the kingdom of God or to their family but in doing so end up spending less time with family or church because all they do is spend their time pursuing wealth. Well this seems to clearly indicate those people have it backwards. Notice the same sentiment taught in Jacob 2:18-19. First and foremost your focus should be on God and His glory. The rest will be added to you. Compare this with Mormon's vision of our day in Mormon 8:35,37. Unlike the world today. there is no poor in Zion because everyone is focused not on themselves but on the glory of God - helping others, loving their neighbour, exalting and saving others. When that happens, you can't help but ensure everyone is provided for - physically, emotionally, and spiritually. The great blessing of being pure in heart is that you shall see God (see Sermon on the Mount). Pure suggests being free of all infiltration, free of extra elements, all that is impure removed and refined. How do you become pure in heart and what then is the one element that should be left pure in our heart? Mormon, through his son Moroni, is teaching us that the element we need in our hearts is charity and the way to get it is to pray for it with all the energy of our heart. This requires removing all thought of self, all selfish wants and desires, instead focusing with an eye single to God's glory on helping others. One of the things that can help us achieve Zion is temples: the covenants we take upon us and the principles we learn. It is no coincidence that the Saints were continually instructed to construct a temple wherever they moved. Temples are necessary in the building of Zion in our cities and in our homes and in our hearts.